Love & Mercy takes an interesting approach to the biopic in that it doesn’t follow the usual linear biographical formula. 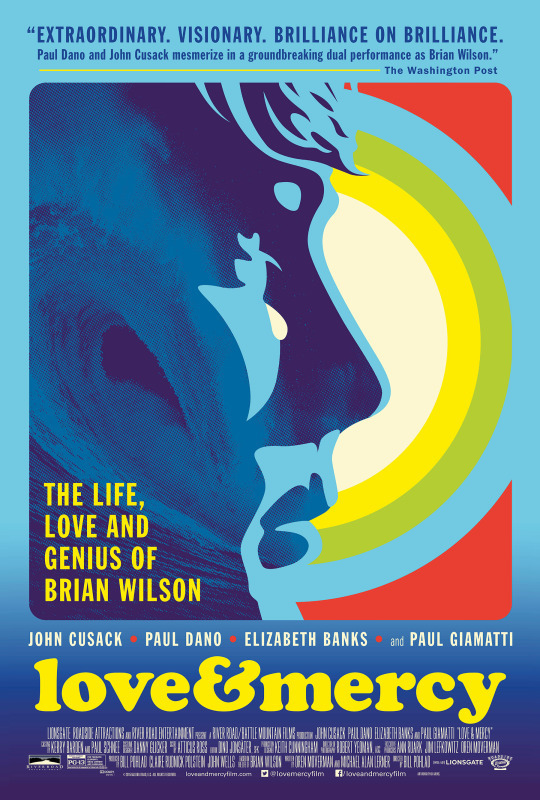 It is the story of Brian Wilson in two distinct, formative eras in his life – his bold creative period in the mid-to-late 1960s as he works on Pet Sounds and the ill-fated SMiLE project, and his rehabilitation period in the 1980s and early 1990s under the controlling and manipulative supervision of psychotherapist Dr. Eugene Landy. The film goes back and forth between these two different periods and, because of this, Brian is portrayed by two different actors: Paul Dano (portraying Brian circa the 1960s) and John Cusack (portraying Brian circa the 1980s-90s). I’ve only seen the film once thus far (though I do hope to buy it when it’s released on DVD on September 15 and rewatch it to make better judgements) but in terms of a biopic and especially compared to previous Beach Boys-centered biopics, I was quite impressed by Love & Mercy. The editing was great. The sound mixing was extraordinary – it really brought you into the world of Brian Wilson and what he goes through. (I should also mention that those who have auditory sensitivities might have a bit of a hard time with this movie, as there are often a lot of things going on audio-wise.) I liked the use of a documentary style camera every now and then, but in some scenes—particularly those involving private conversations—using this style made no sense. I was honestly amazed at the attention to detail and historical accuracy in many of the 1960s-era studio scenes, particularly regarding the Pet Sounds sessions. These scenes were accurate all the way down to much of the dialogue, where it was clear that the actors and filmmakers studied the Pet Sounds session tapes. Likewise, the remakes of actual footage paid fantastic attention to detail and accuracy. All of these parts were such a joy to watch for a diehard fan like me, who has listened to the Pet Sounds session tapes and seen the real, historical footage that was recreated here. As far as the performances go, I ended up being more impressed with Paul Dano as younger Brian than with John Cusack as older Brian. I thought Cusack was ok, he did a good job at getting Brian’s mannerisms right, but I couldn’t get past the fact that it was John Cusack playing Brian Wilson. However, that didn’t happen to me with Dano. I was much more immersed in Dano’s performance which is probably why I liked him more. When it comes to how Brian’s struggles with mental illness were depicted in the film, I’m a little on the fence. In some ways, it feels like the film’s immense focus on his mental illness reduces him to just that even though that shouldn’t (and doesn’t) define his entire being or his musical mastery. And yet, in some regards, it was handled fairly well. Well, compared to the 2000 tv biopic The Beach Boys: An American Family anyway, in which Brian is portrayed as a giant buffoon and a manchild. I at least never felt like Love & Mercy overly infantilized Brian as is so often the gross narrative about him found in other biopics and even in the media. Of course, I might need to rewatch this film to make better judgments on this sort of thing. Still, as impressed as I am with Love & Mercy as a whole, there were still a few things I had issues with. Aside from the issues of time-crunching that seem to pervade most biopics, quite possibly my biggest problem with the film is that there is so much that should have been expanded upon, particularly in the 1960s timeline. In fact, it seemed like a lot of the complexities of the issues, personalities, and relationships in the 1960s timeline were too simplified in an attempt to flesh out more of the 1980s timeline, which to me was a bit disjointed, less interesting, and tended to drag on. Brian’s close relationship with his brothers (fellow Beach Boys Dennis and Carl) was there but didn’t seem to come through enough. Carl’s involvement in getting Brian out of Dr. Landy’s control is barely covered in the film. Brian’s first wife Marilyn, who was also a very important figure in his life and was by all accounts very supportive and loving, was basically reduced to nothing more than a flighty rock n’ roll socialite and was relegated to the sidelines for most of the film. This seemed unfair, considering the fact that Brian’s current wife Melinda (who did have considerable involvement in the film’s production) is treated glowingly as Brian’s “savior” in the film’s 1980s timeline. That’s not to say that Melinda isn’t also very important, but Marilyn deserves credit where credit is due. And in the 1980s timeline, Paul Giamatti’s depiction of Landy is a little too much of a caricature (yes, even considering how over-the-top terrible Landy actually was in real life) and doesn’t seem to have much depth. And though I realize that this is a movie focused on Brian Wilson himself, there still could have been more about his relationships with his collaborators or they could have at least been introduced a little better, as I feel like those who are not as familiar with Beach Boys/Brian Wilson history would have been confused as to who they even were. Tony Asher, lyrical collaborator for Pet Sounds, was in the movie for what seemed like not even a minute and the only reason we know that character is Tony Asher is because the scene involves Brian introducing Tony to the Wrecking Crew musicians. Van Dyke Parks, Brian’s collaborator for SMiLE, thankfully had a few more scenes than Asher but there was still disappointingly little of him. He’s not well introduced, as is evidenced by a few of the reviews and dialogue about this movie that I’ve seen in which people don’t even refer to his character by name and have admitted that they didn’t understand who he was. A few of the scenes involving Van Dyke were also not entirely accurate, such as having Van Dyke’s character present at the infamous “Fire” session in the film even though the real Van Dyke has continually said he was not actually there. (However, he may have been at a different “Fire”-related studio session as evidenced in his presence in this video, where he is, indeed, wearing the plastic firehats that Brian made everyone wear when working on “Fire”). Likewise, the real life confrontation between Van Dyke and Mike Love (that more or less resulted in Van Dyke leaving the SMiLE project) definitely happened in a studio, not at Brian’s swimming pool as it is in the film. (The real life argument also was about the lyrics of “Cabinessence”, not “Heroes and Villains” – but Mike Love had problems with “Heroes” lyrics too so it’s not entirely inaccurate.) I’ll let this scene slide with its inaccuracy though because it’s a wonderfully shot scene that symbolizes the band’s dynamic at this point in their career. Brian is swimming in the deep end, symbolizing his slipping mental state, while the rest of the band and Van Dyke are situated around the other end of the pool in various positions. The two other Wilson brothers are also swimming in the pool but in the shallow end and attempting to convince Brian to come closer to them so they can have a proper band meeting, Mike Love is completely out of the pool and being confrontational, Al Jardine is also completely out of the pool and standing away from everyone so as not to get involved with the drama, and Van Dyke is on the other side of the pool opposite the other band members with his feet dangling in the water before leaving in a huff after being berated by Mike Love. What I am thankful for with this film’s treatment of Van Dyke Parks is that he was not portrayed as some “far-out” pseudo-intellectual drugged-out hippie who was a “bad influence” on Brian, as was the case in the laughably-awful TV biopic The Beach Boys: An American Family in which the real Van Dyke had to contact ABC’s legal department several times to get his character renamed because his character was portrayed so terribly. Because Van Dyke Parks is another one of my All-Time Musical Heroes, I went into Love & Mercy hoping this film would treat him right – or at least with a bit more respect – and thankfully his portrayal in this film was much better than it was in the ABC biopic, even if he’s not given much screen time. Regardless of these issues, I still think that Love & Mercy is one of the better music biopics to have ever been done. Though the second timeline often fell flat and some things were not fleshed out, overall the movie remained more devoted to accuracy than most biopics often do and, most importantly, treated Brian Wilson with more of the respect that he deserves. I give the movie a 3.5 out of 5.